Creative crafters such as dressmakers or quilters are always on the hunt for quality tools and equipment to ensure their masterpieces are ironed to perfection. The hunt is over as the Rowenta DW5197 Focus Steam Iron – which is also an ‘Official Partner of Fashion’; is the finishing touch to your quilt or that glamorous evening dress. My review will look at how the Rowenta DW5197 can make all your handmade fabric items look ‘store new’. Even if you’re not a creative crafter, then this review will also prove to you how this steam iron can make all your clothing look crisp and fresh. Pointy tip – This makes ironing so much easier as this tip will allow you get under collars, buttons and into corner seams to ‘sharpen’ them out. Basically, it gives you access to all areas of your clothing! No auto shut off – This feature ensures the steam iron never turns (unless the plug is pulled out!) which is perfect for creative geniuses when they are often having to set the iron down to open seams up, embossing or heat sealing appliques and hems. Doubles up as a steamer – Thanks to its vertical steam release feature, you can now use you iron upright to iron your drapes and your clothes whilst they are hung up. Longer lifespan – With the anti-calc system in place, this keeps your iron performing its best at all times. It prevents the build-up of dirt, calcium and any other impurities. This helps to extend the life of your iron. Dimensions 12.6 x 7 x 5.7"
The people that know the most about a product is those that have actually used it consistently over a period of time. 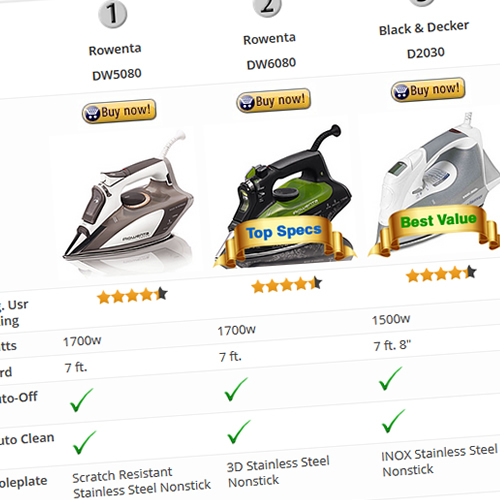 We’ve researched over 50 real user reviews to highlight the positives and negatives of their experiences with the Rowenta DW5197 steam iron. This is not your typical looking iron, the Rowenta DW5197 has a stylish and unique look to it because of its inverted slant design at the back of the iron. It is stacked high boasting a sense of power and confidence in getting the job done right. The Microsteam 400 soleplate delivers even steam distribution. The iron comes in a beautiful dark shade of purple and the handle is wide enough to fit big hands as some users have found. Buttons for the steam release is easily reachable with your thumb so you won’t need to keep shifting the iron about when using. It is easy to manoeuvre the iron without the cord getting tangled as well thanks to the 360 swivel cord. Easy to see embossed symbols on the iron tells you where the water goes in, where the steam comes out and where the water level is making this steam iron simple to use. The thermostat knob fits in nicely and not only does it give accurate readings and temperatures for each type of fabric, but it doesn’t hang off the sides of the iron which is very useful to a lot of users. This means that you won’t be accidentally knocking or sliding the thermostat when you are ironing. Not only is the soleplate on this iron made of the highest quality of stainless steel and patented, but its surface has a highly polished finish which makes the iron glide smoothly over fabrics. You won’t have to worry about your fabrics snagging or bunching as the iron glides. With the 400 microholes on the soleplate, this ensures steam is distributed evenly across the soleplate which will reduce your ironing time. 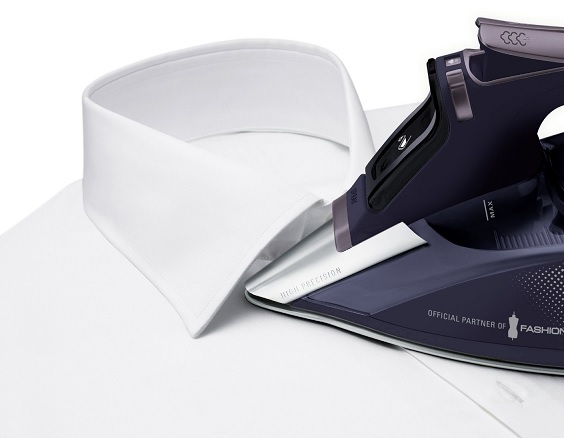 Along with the 1725 watts of power this iron delivers, creases will become a thing of the past on all fabrics. An overwhelming majority of users have had a positive ironing experience with the Rowenta DW5197. Here are some of the main points that have been highlighted by customers. 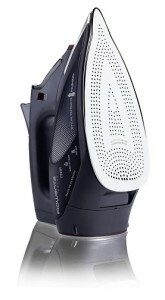 Good gliding abilities and steam output highlights the effective and efficient use of this iron on all types of fabrics. The anti-calc system ensures your fabrics will not be stained as it will stop calcium building up and with the self-clean system, impurities will be removed from the water tank. Not only does this iron have no auto shut off but it also heats up very quickly. The vertical steam release can be used for very delicate fabrics if you do not want to press the iron onto them. Steam is continuously distributed and evenly in a fine mist thanks to its 400 microholes stainless-steel soleplate which also does not rust. The temperature of the soleplate is spread out evenly because of the auto steam feature. It is anti-drip so you will no longer be attacked by spitting hot water and your fabrics will not be ruined either. No auto shut off poses a danger if you forget to switch it off which of course causes overheating and melting. The price is quite high for an iron as people tend to pay the average price of $30 – $40. The iron is quite heavy so your wrists will start to ache after a while. The water tank is not very big so if you’re ironing a lot of fabrics, then expect to be filling this up a few times. Like the rest of Rowenta steam irons, the Rowenta DW5197 has a self-cleaning button which helps to remove any limescale and impurities that are in the water tank. This will eliminate the time and effort needed to manually clean your iron. Along with the anti-calc system which prevents the build of dirt and calcium in your iron, you can be sure this iron will last you a lifetime. As mentioned before, the Rowenta DW5197 is perfect for creative crafters as this steam iron is aimed towards them because of the ‘no auto shut off’ function. However this is also useful for those of you who often have a lot of clothing to iron but find that the iron has turned off whilst you were storing an ironed item away. With the vertical steam function, you won’t need an ironing board and with your fabrics hung up to iron, it is easier to see where the creases are. This is ideal as well if you have your own shop selling your clothing designs; it makes it easier to keep your fabrics looking sharp. You won’t regret investing this amount of money into this steam iron as it will last you a long time and even longer because of the anti-calc system, you save time on cleaning, it’s small so it’s easily storable anywhere and for your peace of mind, you know it will not ruin your fabulous fabric designs or your clothing, even the most delicate ones. 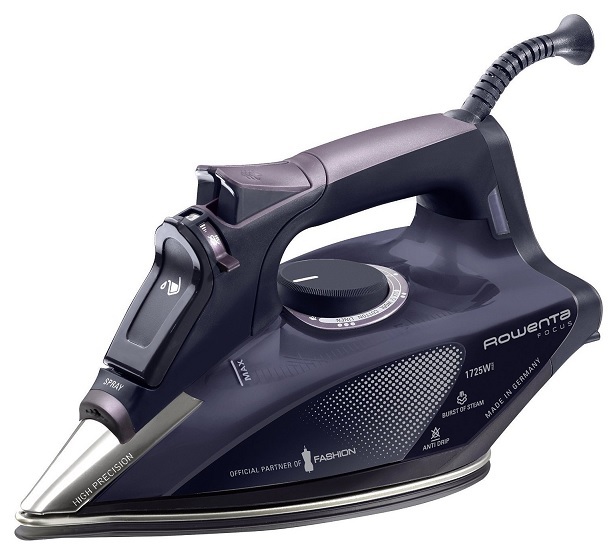 Click Here To See The Live Prices On The Rowenta DW5197 Focus Steam Iron Today!